Downtown Seattle and South Lake Union are the next neighborhoods where Mayor Ed Murray wants to allow taller buildings while requiring developers to help create affordable housing. Under the proposed upzone, new projects would be allowed to climb one or several stories higher, depending on location. In some cases, projects would be allowed more floor area. Besides downtown and South Lake Union, the upzone would also include a sliver of industrial and commercial property between South Charles Street and Interstate 90. But the Pike Place Market and Pioneer Square historic districts would be exempted from the changes, which the council’s land-use committee will take up Tuesday. That program already is coming to the University District because the council voted to upzone that neighborhood last month. Murray will ask the council to upzone more than two dozen additional neighborhoods later this year and next year. He says the program’s goal is to create 6,000 rent-controlled units over 10 years. In downtown and South Lake Union, housing developers would need to make about 2 to 5 percent of their units rent-controlled or pay fees of $5.50 to $13 per square foot. Commercial developers would need to devote about 5 to 11 percent of their gross floor area to rent-controlled units or pay fees of $8 to $17.50 per square foot. The affordable-housing requirements proposed for downtown and South Lake Union are lower than those proposed for other neighborhoods. That’s because high-rise buildings are particularly expensive to construct and because the zoning changes would be more incremental there than in other neighborhoods, Murray administration officials say. It’s also because some downtown and South Lake Union zones already require developers to provide benefits such as public open space and street improvements, officials say. Despite the lower affordable-housing requirements, Murray administration officials say downtown and South Lake Union would generate as many as 2,100 rent-controlled units. Where those would be located is another story. Most developers in downtown and South Lake Union would likely choose to pay fees rather than include units in their buildings. The city would use the fees to help nonprofit developers build rent-controlled housing. 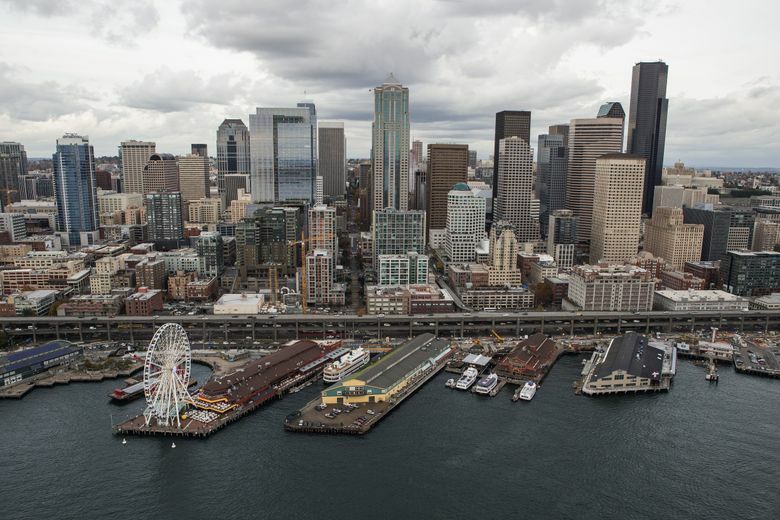 Those projects could be in downtown and South Lake Union or could be in other neighborhoods. Officials say fees are valuable because they can be combined with other financing to create more affordable housing. If the council approves the upzone, the developer of a 44-story apartment building might be required to include 25 rent-controlled units or pay $5 million in fees. The developer of a 35-story commercial building might be required to include 74 rent-controlled units or pay $7.8 million in fees. Since 2001, the city has operated an incentive-zoning program in parts of downtown and South Lake Union. Under that program, developers can choose to build affordable housing or pay fees in exchange for more floor area. If the council approves the upzone, Murray’s new, mandatory program would replace the existing, voluntary program. 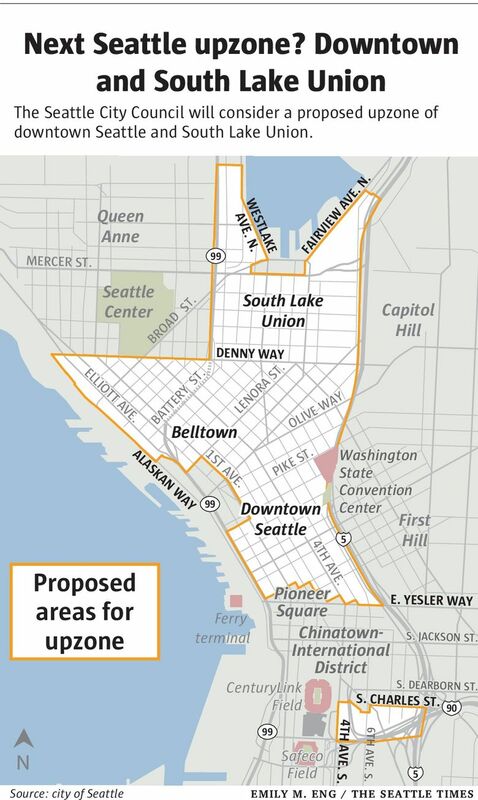 The downtown and South Lake Union upzone may prove less controversial than those proposed for neighborhoods such as Wallingford, Othello and South Park, which would allow larger apartment buildings and convert some blocks now zoned exclusively for single-family, detached homes.